The doors open for early sign-up at 2pm. Patrons will be called down to the pantry beginning about 3:30pm. Shopping will begin at 4pm, and patrons will be called to shop in the order in which they signed up. Each patron MUST be present to shop. They may ONLY shop for themselves; no shopping for patrons who are not present. Shopping carts must remain in the building and cannot be brought into the parking lot. No Photo ID’s, proof of income, or proof of residency are necessary to receive groceries. Any patron under the age of 18 must have a card from a referral agency. These cards will be kept on file. No one under the age of 18 without a referral. No exceptions. Only one person per household address may get groceries. Each patron is limited to 6 visits within a 12-week time period. Shower facilities are available, but only one person at a time is allowed in the bathroom. All are expected to conduct themselves in a way becoming of an adult. There will be no loud, abusive or vulgar language tolerated. Not conducting yourself in a proper manner may be grounds for temporary suspension of shopping privileges. Patrons and church members are welcome to serve as volunteers. Volunteers will be walked through before the pantry opens and will be supervised by a leader. If you are caught stealing from Church of the Open Arms you will be given three chances. First strike: You will not be allowed to visit the food pantry for a period of 1 month. Second strike: You will not be allowed to visit the food pantry for a period of 3 months. Third strike: You will be permanently barred from shopping at the food pantry. If you are harassed while in the building, please let a food pantry leader know. Sexual harassment or assault will result in immediate and permanent removal from the food pantry. 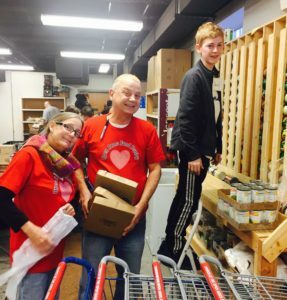 Volunteering at our food pantry is a wonderful way to make a difference in the lives of others. On Thursdays, we need people who can lift between 1:30-2:30. to help unload the Food Bank truck. On Fridays, we need people from 2-6 p.m. who can lift. Any time you might have to offer during this period, especially any time between 4-6, will be appreciated. Even if you can only come help for an hour, you will be blessed! To volunteer with the Food Pantry, contact Bo Wright-Bass at bodoesavon@gmail.com. We need non-perishable items like canned vegetables & meat, peanut butter, and personal hygiene items (toothpaste & toothbrushes, soap, etc.) and we always need gallon-size freezer bags.